When I featured a quick snippet of this pan bubbling away on my Instagram Stories, I could never have anticipated the reaction! Hundreds, no, thousands of people clamouring for the recipe, a recipe I wasn’t even responsible for. You see my fiancé is on a cooking kick. In something of a PMS induced red haze I may have snapped something about him not pulling his weight and lo and behold, the next week my spot was taken at the cooker. Wafts of herbs, soft shallots, caramelising apple and crisping crackling came floating into my office and I followed like a cartoon dog pulled along by its snout. He bases his recipes on dishes he likes at restaurants, this particular one is inspired by The Wolseley, on Piccadilly. Though I like his version better! 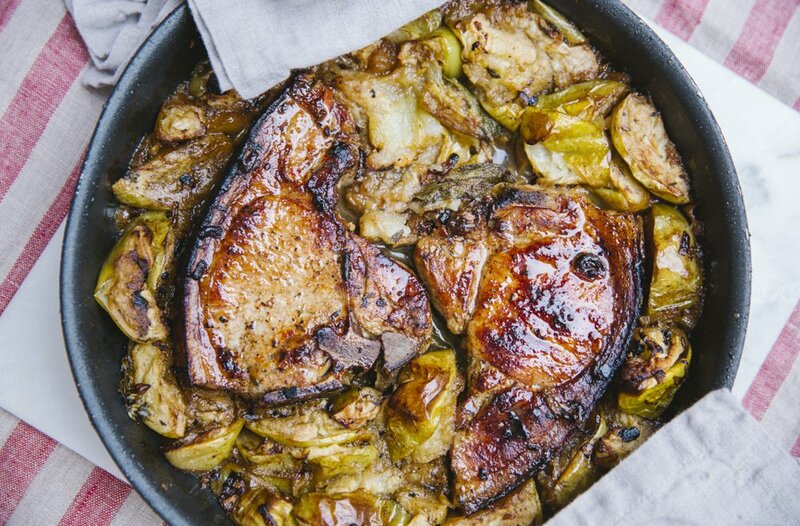 Plump, rich pork chops with melting fat and crunchy crackling, steeped in cider and surrounded by sweet apples infused with thyme and dotted with crisp sage leaves. Pre-heat your oven to 180C/350F. Slice up your shallots, core and chop your apples into segments (cut into quarters, then half those quarters). Season your pork chops generously with salt and pepper. When you’re ready, pop your frying pan on a medium heat with a good drizzle of olive oil. Throw in the thyme to flavour it. When it’s nice and hot, fry your chops so that they brown on each side. Then rest them on their crackling until it starts to crisp. Throw in your shallots and fry until soft and just starting to brown. Remove your chops and place on one side. Throw in your apples and toss in the herby sauce until glistening. Add a 3-4 sage leaves. Then nestle your chops back into position, surrounded by apples. Pour in about half a can of cider, enough so that the chops are swimming in it but not drowned in it. Put the whole thing in the oven (minus the pan handle in my case!) for about 30 mins, keeping an eye on it – when the meat is golden brown and the apples soft and gooey – it’s done! You could add a side of mash, fresh greens, roasted veg, buttered peas, a crisp salad, or just a crunchy baguette. If you want my sage advice – send it to the non-cook in the family right now! It’s about thyme, after all.